It’s Children’s Dental Health Month, which means now is a great time to brush up on your baby teeth facts! 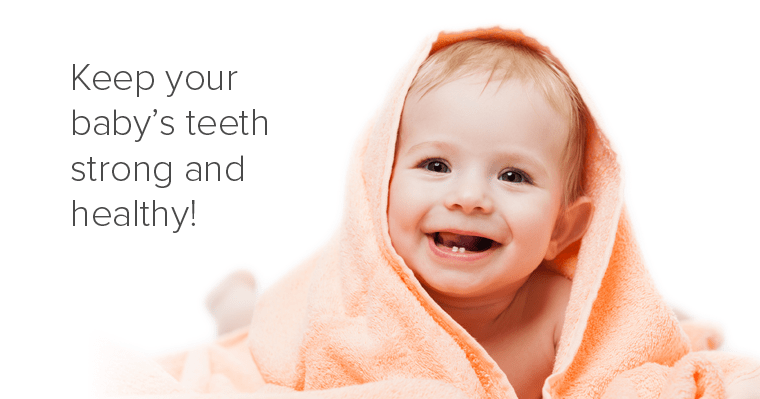 Baby teeth play a big part in overall dental health and development. Helping kids learn to properly care for their baby teeth early can have a big impact on their future oral health – even once adult teeth come in. Baby teeth generally begin to emerge around 6-8 months of age and require diligence by parents to keep them healthy and cavity-free. By helping your child learn healthy habits from the beginning, they will continue those preventative habits into adulthood, saving them from pain and expensive future dental problems. Keeping up on your child’s oral health can help prevent painful toothaches or periodontal disease, which could alter the way he or she speaks. During these developmental years, the way your child learns to talk and chew can have long-lasting effects. Your child’s baby teeth are holding the spots where their adult teeth will come in later (beginning around 4-6 years of age). Keeping up the health of your child’s teeth and gums before the adult teeth emerge allows the adult teeth to come in smoothly and safely. Preventing periodontal disease can never start too early! Which toothbrush should you choose? Use a soft‐bristled, infant toothbrush with a tiny amount of non‐fluoride toothpaste once a day at bedtime. This helps eliminate bacteria from the teeth. Bacteria is the culprit that can cause tooth decay. This will also get your child used to the idea of brushing. What type of toothpaste is best? Find non-fluoride toothpaste in the store for younger children. Wait until your son or daughter is at least three years old and knows not to swallow toothpaste before using a fluoride paste. When should you start dental office visits? We recommend bringing in your child for their first dental visit around the time he or she turns one year old. If your child doesn’t have any baby teeth by this age, don’t worry. Some children have their teeth emerge later than others, but you can always schedule some time to talk to your dentist to make sure there aren’t any underlying medical issues. If you have questions about caring for those all of those important baby teeth, call your dentist to schedule an appointment!